Distinctive Dentistry (Highlands Ranch) - Book Appointment Online! 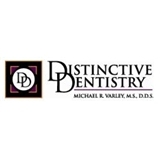 Highlands Ranch Dentist, Dr. Michael Varley and staff are dedicated professionals whose focus is providing General, Cosmetic and Family Dentistry. You will quickly observe that your comfort is our top priority. Our entire team is dedicated to providing you and your family with the personalized, gentle care that you deserve. Among the many services that we provide are examinations, cleanings, fluorides, teeth whitening, veneers, caps, crowns, root canals, endodontic therapys, implants and more. In addition; Dr. Varley, a TMJ dentist, is exquisitely trained in jaw problems, bite disorders and related headaches. Dr. Varley is a former instructor at the University of Detroit School of Dentistry so bring in those special concerns such as tooth fracture, tooth sensitivity, denture issues, or gum problems. I always feel comfortable with the friendly staff. After 14 years, it feels like we're family. I also completely trust Dr. Varley's care & treatment.